Kupiskis, known in Yiddish as Kupishok, was home to 1,444 Jews before World War II. Today no Jews live in Kupiskis. Amazingly, however, there are over 60 people around the world researching their Jewish ancestors from this small Lithuanian town. Most of them are listed in the JewishGen Family Finder. If you have more information or if you are a Kupishok descendant please contact Ann Rabinowitz or the Webmaster, Linda Cantor. According to Where Once We Walked, the authoritative gazetteer of Eastern European Jewish communities published by Avotaynu, the town is located 101 km E of Siauliai; 55°50'/24°58'. Many Jews arrived in Kupiskis from Spain or Cologne, Germany. There is an account of a document, which unfortunately was destroyed during the First World War, detailing the history of one Kupiskis family (the Trapidos) as far back as the expulsion from Spain in 1492. One interesting anecdote about the Jewish community in Kupiskis relates the story of the manager of the Jewish community's bank. At some point in time, this trusted official stole all the money in the bank, and disappeared, sending nearly 300 families into bankruptcy. 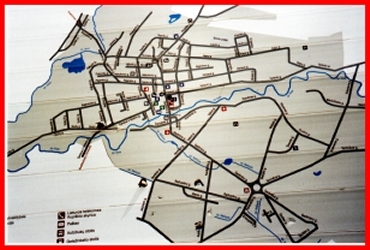 Originally, the station was designed for a location in the center of town. However, the City elders did not want to pay the expected bribe to have this accomplished. Therefore, the railroad company built the station outside town and people then had to walk quite a bit or hire a wagon or carriage to take them there. This photo shows the original wooden railroad station with a group of railroad employees. This is how it looked when many of our ancestors started their trip to the outside world. 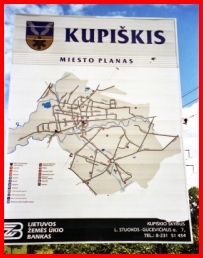 As you will note, the station sign states both of the old names of Kupiskis which were Slawinski and Kupischki. This is closer to how the station looked when immigrants left in the 1920's and 1930's. KUPISKIS (Lith. Kupiskis, Kupiskiai; Yid. Kupishok; Rus. Kupishki), town in N.E. Lithuanian S.S.R. Tombstones from the 17th century have been found in the local Jewish cemetery. There were 1,350 Jews living in Kupiskis in 1847 and 2,661 (71% of the population) in 1897. 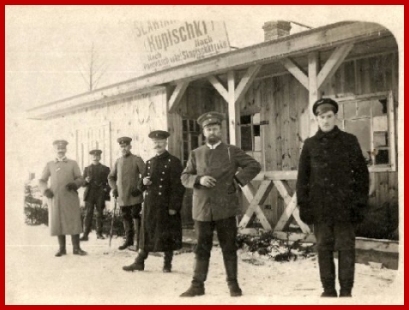 During World War 1, in May 1915, the Jews were expelled from Kupiskis, and only part of the Jewish population returned there after the war. The community numbered 1,444 (54%) in 1923, and continued to decrease in the interwar period, many of the youth emigrating to South Africa and Eretz-Yisrael. The Jewish people's bank there had 369 members in 1929. As Kupiskis was one of the few towns in Lithuania with a considerable community of Hasidim, there were two officiating rabbis. The community had three synagogues, a yeshivah, a talmud torah, and three schools (Yavneh, Tarbut, and a Yiddish school). After the German occupation the community was annihilated. Many thanks go to Ann Rabinowitz, who has worked so hard to gather most of the materials on this page, who has inspired our SIG, kept us together as a group, and helped us each so many times. We wouldn't be here without you, Ann!